Wojciech Szczesny has welcomed former Arsenal teammate Aaron Ramsey to Juventus, ahead of his move to Turin this summer. 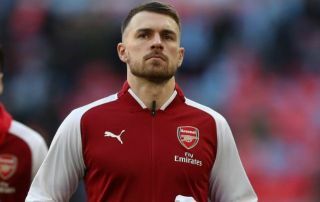 As confirmed on the club site, the Bianconeri have announced that Ramsey has penned a four-year contract with them and will join on July 1, after his current Arsenal deal expires. In turn, he’ll begin planning his future sooner rather than later, albeit he will undoubtedly be focused on ending his spell in north London on a high by helping the club qualify for the Champions League before he moves on. Nevertheless, Szczesny is evidently pleased to be set to play alongside the Welshman again, as seen in his message below, which he left on Ramsey’s Instagram post confirming his Arsenal exit. It could be argued that the Polish shot-stopper has aimed a little dig at the Gunners too by suggesting that “the next few years is all about winning”, although it could easily be an innocent remark and a nod to the fact that Juve continue to dominate domestically and are looking to end their wait for glory in Europe. Further, he also jokingly suggested that he wants a commission as part of Ramsey’s move to Italy, as clearly he’s pleased to be joined by his former Gunners teammate in Italy. It’s undoubtedly an exciting move for the 28-year-old, as he gets the opportunity to play alongside the likes of Cristiano Ronaldo and Paulo Dybala to improve as an individual, while the Turin giants are expected to win trophies year in and year out. As per BBC Sport, he’s been tipped to earn a staggering £400,000-a-week+, and so there will be major expectations of him too to help improve the squad and ensure that Juventus continue to compete for major honours moving forward.